When choosing between joseki moves, leading to a particular joseki or to a number of possible variations in a joseki, your choice should fit in with the overall situation on the whole board. 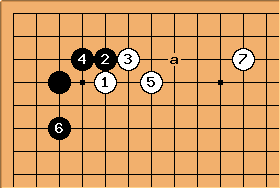 Selecting the correct joseki move is therefore an aspect of the direction of play. which direction he wants to emphasize, and how the result relates to other stones on the board. whether his goal is to obtain influence or territory. 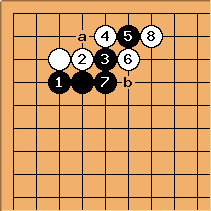 whether he wishes to retain sente or is content to end the joseki in gote. which shapes he will create. Additionally, some choices may depend on external factors, such as ladders or ko-threats. While all of these factors affect joseki selection, sometimes one player and sometimes the other will get to make the final choice. 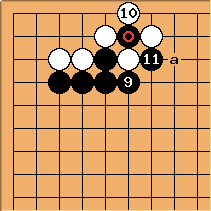 In most joseki variations, there will be a specific move at which either Black or White decides, for example, which player will get sente coming out of the joseki; however, even if Black gets to make such a decision on one branch of a joseki, White may be able to decide to avoid that branch at an earlier move. Thus joseki selection requires the player to think recursively. 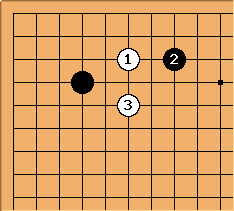 Players starting to learn joseki often forget about these four decisions. Knowing only a small number of joseki, they select familiar joseki without noticing that they have thereby made each of the four decisions mentioned above. This is bad, because the consequences of these decisions are often more important than the joseki itself. Achieving one's strategic goals with slightly less efficient shape is often better than achieving nothing in perfect shape. The solution to this problem is not to forget about joseki, but to learn more about them. As the proverb says: Learning joseki loses two stones strength, studying joseki gains four stones strength. Classic dilemma: On which side to block ? The 3-3 invasion under a 4-4 stone offers the classic example of a decision about direction. Black can block on either side. Blocking the left side of the board and blocking the top side of the board are equivalent on an otherwise empty board, but when surrounding stones influence the situation one direction is better for Black. There is a proverb that helps us choose the correct direction: Block on the wider side. 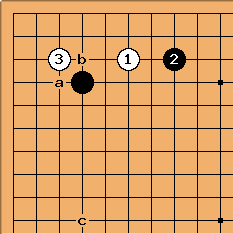 In this example we add two black stones on the side, on the left and top sides, respectively. 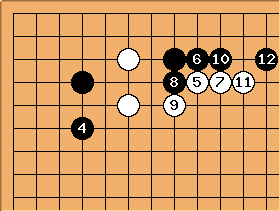 The stone on the left side is further from the wall that the joseki creates than the stone on the top side would be, so we block on the wider side with . 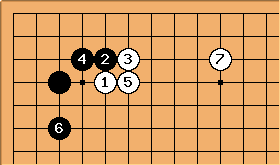 Note that in this example, is not a different joseki than a move at b. Selecting a direction does not always affect the joseki played, although as we will see in the next example, often selecting a different direction does require the player to select a different joseki. After approaching the black corner stone, and played as a pincer, jumps into the corner. Now Black has a choice between the two directions a and b, each of which leads to one or several distinctive joseki. 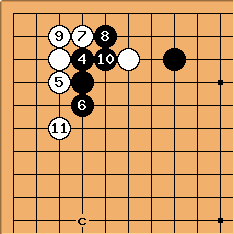 As we saw in the 3-3 invasion, the correct direction for Black to emphasize depends on the location of outside stones. Without surrounding stones Black should prefer Option 1. 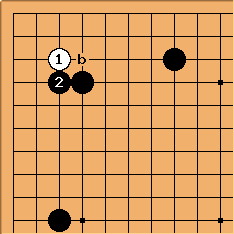 On the other hand, a stone at or around c serves as a natural extension to the black wall that is formed by Option 2; since c doesn't work very well with the wall formed by Option 1, when Black has c he prefers Options 2. Up to now it may appear that Black makes all the decisions in this joseki. But in fact, White can play "d" instead of . In this variation, Black ends stronger on the upper side than in Option 2, but White can reduce Black's framework later. in the previous diagrams also represents a decision -- a decision to emphasize territory over influence. 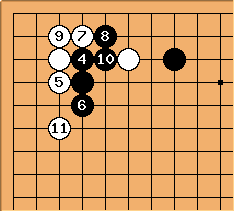 Instead of invading in the corner, White can decide to build influence by selecting a joseki which starts with . As with Blacks choice of direction in the previous diagrams, whether territory or influence is more important is a very important decision which requires White to think about things like the positions of surrounding stones. Amateur players often forget that they can select either sente or gote joseki. Even if you have chosen a joseki that emphasizes the correct directions and the correct balance of influence and territory, if you thoughtlessly play gote joseki your opponent will grab an unfair share of the big points on the board and surge ahead to victory. After Black must decide whether to play a or b. 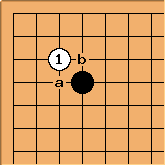 The former allows Black to take the corner in gote, while the latter allows him to build up a strong outside wall in sente. Many amateur players will realize that they have to decide between the wall and the corner, but even strong amateurs easily forget that they are _also_ deciding between gote and sente. You must not forget that very frequently you have a choice between joseki ending in gote and joseki which retain sente. 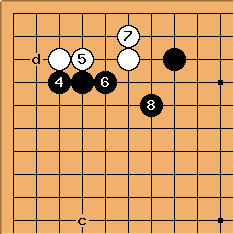 capturing a black stone is forced, if White does not capture but plays at , Black still can cut to take the corner like in option 1. After , White will either leave behind a ko (starting at a), or Black gains sente to turn to another urgent area. With White can choose between the solid connection in the first diagram or the hanging connection shown in the second one. 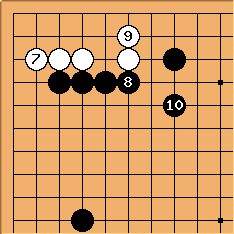 While the hanging connection allows White to extend a bit further, it leaves more aji at a than the solid connection does. 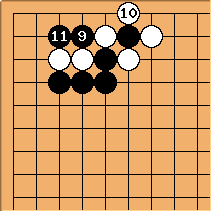 These two joseki are similar: they are both gote joseki that emphasize the upper side. However, while is not a decision that allows White to select a direction or retain sente, it is still an important decision about shape.